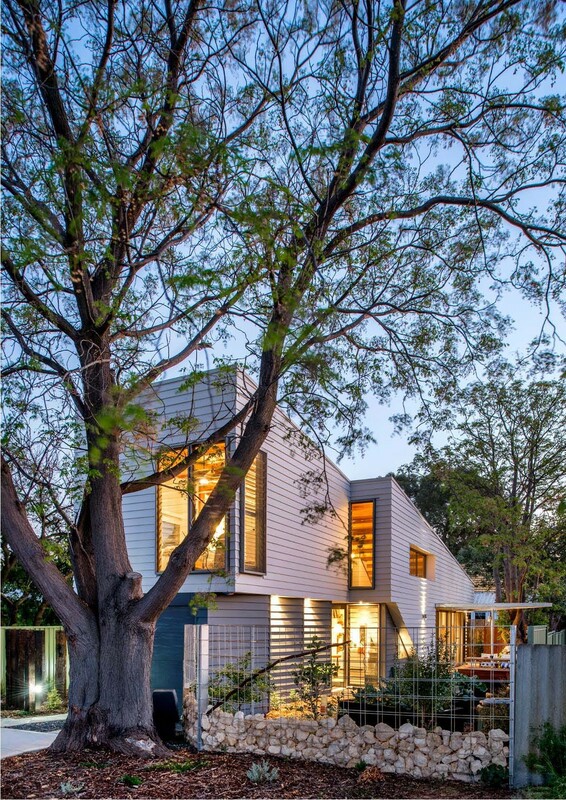 The house in Western Australia addresses two main concerns: environmental sustainability and aging in place. The narrow structure is oriented to make the most of views of the tree-lined property, which helps passively regulate temperatures by blocking sun in summer and allowing in heat in winter. Native plantings limit the need to use water for irrigation, while a vegetable garden offers a sustainable source of produce. The house was designed with an open floor plan to facilitate aging in place. White walls prove a crisp backdrop for details in wood and concrete. When building a house for a client who was about to retire, Mountford Architects of Perth, Australia, decided to look ahead. But it wasn't just the client's next stage of life that was on their minds, the team also sought to build sustainable systems as insurance against a drying climate. The first challenge of the project was space. Bucking the trend toward oversize homes, the client requested just two bedrooms—one of the top floor and a universally accessible one below; each with its own spacious bathroom and direct access to the shared living areas. But on a lot of just over 3,000-square-feet, accommodating both the new house and a working vegetable garden would be a tight fit. The architects achieved this by building just 1,700 square feet, with a narrow profile that makes the most of the views of the tree-lined property. The roofline of the steel- and timber-framed house is meant to reference its neighbors in this once-industrial area. Working with a client knowledge in environmentally sustainable design, the architects were able to employ a number of "low-tech" sustainable solutions. To save water, the homeowner opted for a mulched landscape punctuated by native plants, along with a raised vegetable garden and fruit trees for growing food. In addition to food, the house also harvests its own rainwater for toilets and laundry and graywater for irrigation. On the more technical side, photovoltaic panels on the roof generate electricity. Solar energy is also used to heat water for the house. The living room is capped by a sloping plane of oiled LVL (laminated veneer lumber) and plywood. The angle of this high ceiling is oriented to the north, with a combination of cross ventilation, thermal massing, and sun shading devices used to passively achieve a comfortable temperature. Charcoal-burnished concrete floors also help absorb excess heat. The resident had a specific view of sustainability, requesting that the team at Mountford Architects "make use of as many of the block's natural resources as possible," while also considering "ordinary materials imaginatively." In the interior, this translates to a mix of warm and cool textures that help contribute, however invisibly, to an efficient, low-maintenance home that will facilitate aging in place for years to come.